The Progress Report describes the status of indicators which measure the progress that our community is making toward realizing the Cityof Albuquerque’s Vision and its Five-Year Goals. The Indicators Progress Commission (IPC) has the statutory responsibility for developing these indicators. The IPC is a citizen body appointed by the Mayor with advice and consent of the City Council. As a result of community goals forums held in the summer of 2002, goals and resulting desired community conditions were developed by several hundred citizens. These goals and desired conditions were formally adopted by the City Council and approved by the Mayor, pursuant to the City Charter and Budget Ordinance. The desired community conditions flesh out in more detail what the realization of each one of the Five-Year Goals would mean. The IPC identified one or more measures of these conditions — Goal Progress Indicators. The indicators are the heart of the progress report. They measure trends, and where no trend data is available, establish baselines for future comparison. Trends will continue to be tracked, as appropriate, and reported in future updates of the Progress Report. 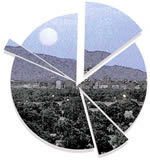 Albuquerque is a thriving high desert community of distinctive cultures coming together to create a sustainable future.